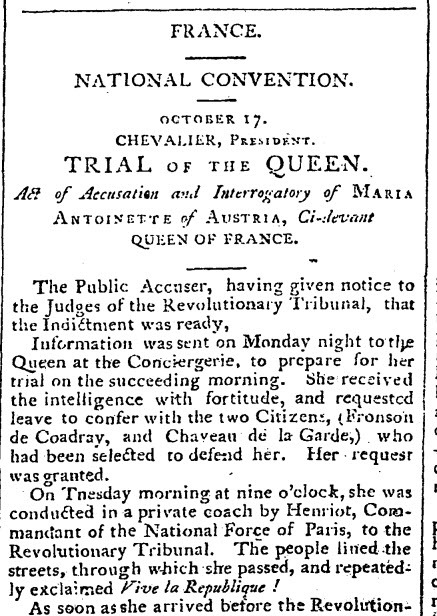 I recently read an article about Marie Antoinette's jewels been auctioned, which got me thinking about how far back our newspaper archives go and I thought try Proquest Historical Newspapers which has The Guardian (1821-2003), The Observer (1791-2003); Irish Times (1859-2010); Weekly Irish Times (1876-1958). So I simply put in "Marie Antoinette" in the search terms to see what I would get, I then re-ordered my search so I got the oldest items first and voilà, there in my search results was the Trial of Marie Antoinette and the Execution of the Queen of France, all from 225 years ago. Nothing like sorrow or pity for the Queen's fate was shown by the people, who lined the streets, through which she had to pass. On her arrival at the place de la Revolution, she was helped out of the carriage, and ascended the scaffold with seeming composure. She was accompanied by a Priest, who discharged the office of Confessor, and gave her absolution,before she was ﬁxed to the fatal machine. She was in a half-mourning dress, evidently not adjusted with much attention. Her hands were tied behind her back, she looked around, apparently without much terror; her body being then bent forward by the machine,the axe was let down, and at once separated the head from the body. After the head was displayed by the Executioner, three young woman were observed dipping their handkerchiefs in the streaming blood of the deceased Queen. They were taken into Custody.